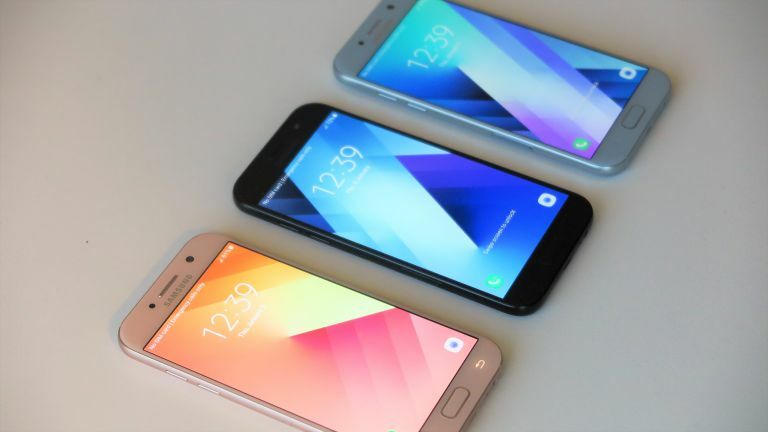 Samsung's new A Series has arrived in store in the UK - check out the deals below. The Galaxy A5 2017 and Galaxy A3 2017, bring IP68 water and dust resistant proofing to the mix along with a raft of other features. As you might expect, the A5 2017 is the larger of the two with a 5.2-inch screen, while the A3 2017 comes with a slightly smaller 4.7-inch display. SIM-free Galaxy A5 pricing starts at £369 and £279 for the Galaxy A3. From Carphone Warehouse, the Samsung Galaxy A5 is available for free from £27.50 a month with 500MB of data, while the cheaper Galaxy A3 is available with 3GB data for free at £25.99 per month. Both these deals are on EE. The A Series models are available to buy in four colours including Black Sky, Gold Sand, Blue Mist and Peach Cloud. In plain English, that's Black, Gold, Sky blue and pink.